System administrators can configure High Availability (HA) in an API Gateway environment to ensure that there is no single of point of failure in the system. This helps to eliminate any potential system downtime in production environments. 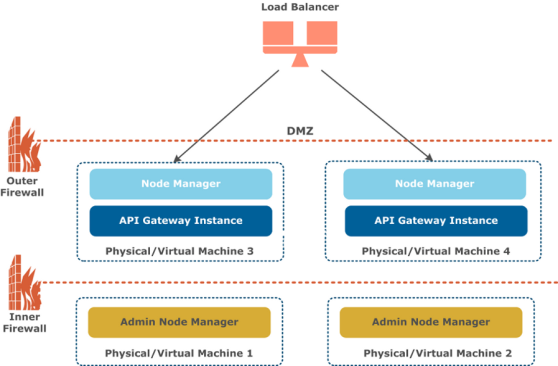 Typically, the API Gateway platform is deployed in the Demilitarized Zone (DMZ) to provide an additional layer of security for your back-end systems. This topic describes the recommended API Gateway architecture in an HA production environment. It includes recommendations on topics such as load balancing, commonly used transport protocols, caching, persistence, and connections to external systems. An external client application makes inbound calls sending business traffic over a specific message transport protocol (for example, HTTP, JMS, or FTP) to a load balancer. A standard third-party load balancer performs a health check on each API Gateway instance, and distributes the message load to the listening port on each API Gateway instance (default is 8080). Each API Gateway instance has External Connections to third-party systems. For example, these include databases such as Oracle and MySQL, and Authentication Repositories such as CA SiteMinder, Oracle Access Manager, Lightweight Directory Access Protocol (LDAP) servers, and so on. Caching is replicated between each API Gateway instance using a distributed caching system based on Ehcache. Each API Gateway instance has Remote Host interfaces that specify outbound connections to back-end API systems, and which can balance the message load based on specified priorities for Remote Hosts. Each API Gateway instance connects to an external Apache Cassandra database used by certain features for persistent data storage, and which has its own HA capabilities. Each API Gateway instance contains an embedded Apache ActiveMQ messaging system, which can be configured for HA in a shared file system. Each back-end API is also replicated to ensure there is no single point of failure at the server level. Management traffic used by the Admin Node Manager, API Gateway Manager, and Policy Studio is handled separately on different port (default is 8090). Note For simplicity, the diagram shows two API Gateway instances only. However, for a resilient HA system, a minimum of at least two active API Gateway instances at any time, with a third and fourth in passive mode, is recommended. In this HA production environment, the load balancer performs a health check and distributes message load between API Gateway instances. The API Gateway supports a wide range of standard third-party load balancing products (for example, F5) without any special requirements. Multiple API Gateway instances can be deployed active/active (hot standby) or active/passive (cold standby) modes as required. The health check returns a simple <status>ok</status> message when successful. In this way, if one API Gateway instance becomes unavailable, the load balancer can route traffic to an alternative API Gateway instance. Both transparent load balancing and non-transparent load balancing are supported. For example, in transparent load balancing, the API Gateway can see that incoming messages are sent from specific client and load balancer IP addresses. The API Gateway can also extract specific client details from the HTTP header as required (for example, the SSL certificate, user credentials, or IP address for Mutual or 2-Way SSL Authentication). 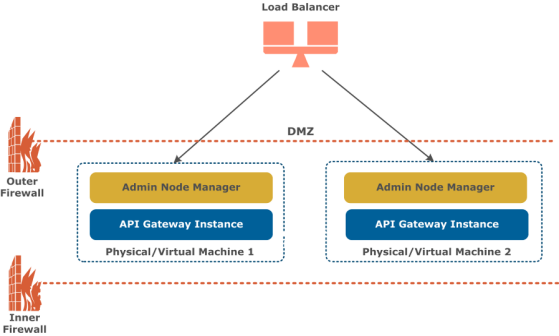 In non-transparent load balancing, the API Gateway sees only the virtual service address of the load balancer. In addition, the API Gateway can also act as load balancer on the outbound connection to the back-end APIs. For more details, see Remote Hosts. The API Gateway can act as a JMS client (for example, polling messages from third-party JMS products or sending message to them). For details on configuring API Gateway client connections to JMS systems, see the API Gateway Policy Developer Guide . For details on configuring HA in supported third-party JMS systems, see the user documentation available from your JMS provider. The API Gateway also provides an embedded Apache ActiveMQ server in each API Gateway instance. For more details, see Embedded Apache ActiveMQ. When using FTP protocols, the API Gateway writes to a specified directory in your filesystem. In HA environments, when the uploaded data is required for subsequent processing, you should ensure that the filesystem is shared across your API Gateway instances—for example, using Storage Area Network (SAN) or Network File System (NFSv4). For more details on configuring FTP connections, see the API Gateway Policy Developer Guide. Mapping a host name to a specific IP address or addresses (for example, if a DNS server is unreliable or unavailable), and ranking hosts in order of priority. Specify load balancing settings (for example, whether load balancing is performed on a simple round-robin basis or weighted by response time). Allowing the API Gateway to send HTTP 1.1 requests to a destination server when that server supports HTTP 1.1, or resolving inconsistencies in how the destination server supports HTTP. Setting timeouts, session cache size, input/output buffer size, and other connection-specific settings for a destination server. For example, if the destination server is particularly slow, you can set a longer timeout. For details on how to configure Remote Host Settings in Policy Studio, see the API Gateway Policy Developer Guide. In an HA production environment, caching is replicated between each API Gateway instance using a distributed caching system. In this scenario, each API Gateway has its own local copy of the cache, but registers a cache event listener that replicates messages to the caches on other API Gateway instances. This enables the put, remove, expiry, and delete events on a single cache to be replicated across all other caches. In the distributed cache, there is no master cache controlling all caches in the group. Instead, each cache is a peer in the group that needs to know where all the other peers in the group are located. Peer discovery and peer listeners are two essential parts of any distributed cache system. For more details on configuring distributed cache settings, see the topic on Global Caches in the API Gateway Policy Developer Guide. The API Gateway distributed caching system is based on Ehcache. For more details, see http://ehcache.org/. For details on how to configure External Connections in Policy Studio, see the API Gateway Policy Developer Guide. For details on how to configure HA for any external third-party systems, see the product documentation provided by your third-party vendor. Note When configuring connections to server hosts, it is recommended that you specify server host names instead of IP addresses, which are less stable and are subject to change in a Domain Name System (DNS) environment. If your API Gateway system uses any of these features, you must configure an external Apache Cassandra database for HA. All API Gateways in a group can share the same external Cassandra data source. In a production environment, you must configure the API Gateway group to use the same Cassandra data source to provide HA. Note All nodes in a Cassandra cluster must run on the same operating system (for example, Windows or UNIX/Linux). For more details on installing and configuring an external Cassandra database for HA, see the API Gateway Installation Guide. The API Gateway provides an embedded Apache ActiveMQ broker in each API Gateway instance. In a HA production environment, multiple ActiveMQ broker can work together as a network of brokers in a group of API Gateways. This requires setting up a shared directory that is accessible from all API Gateway instances—for example, using Storage Area Network (SAN) or Network File System (NFSv4). In this shared network of ActiveMQ brokers, each API Gateway can start a local embedded ActiveMQ broker, which listens on a configured TCP port (61616 by default). This port is accessible from both the local API Gateway and remote clients using the load balancer. For more details on Apache ActiveMQ, see http://activemq.apache.org/. Multiple API Gateway instances are deployed on separate nodes in the DMZ, and all nodes can communicate with each other. Each node runs an Admin Node Manager in an active/active configuration, and there are no Node Managers. This means that the API Gateway management infrastructure is deployed in the DMZ. 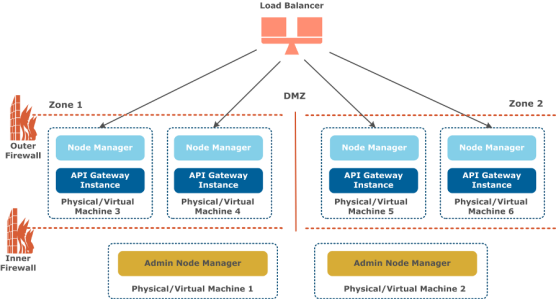 Similar to scenario 1, multiple API Gateway instances are deployed on separate nodes in the DMZ, and all nodes can communicate with each other. However, the management infrastructure cannot be deployed in the DMZ, and must be deployed behind the internal firewall. All nodes in the DMZ run Node Managers instead. There are two nodes deployed behind the internal firewall running Admin Node Managers in an active/active configuration. Both Admin Node Managers can manage any Node Manager in the DMZ. This deployment pattern is a refinement of scenario 2. The DMZ is divided into multiple zones with no inter-zone communication. Multiple API Gateway instances are deployed on separate nodes in each zone, and all nodes in the zone can communicate with each other. All nodes in the DMZ run Node Managers. There are two nodes deployed behind the internal firewall running Admin Node Managers in an active/active configuration. Both Admin Node Managers can manage any Node Manager in any zone. You must configure at least two Admin Node Managers in a domain for high availability and security. For details on how to configure and secure multiple Admin Node Managers in a domain, see Configure Admin Node Manager high availability.